We thought we would be waiting until Sunday to leave Bimini, but suddenly on Friday, Saturday started to look good. There were 20 sailboats and a handful of motor yachts in the marina, all of us anxious to leave, but none more than the eight of us who have been here over two weeks. The decision was made in late afternoon on Friday to leave at 4 am on Saturday. Three of us were leaving then and all of the others were leaving after sunrise. We planned to go all the way to Chub Cay, while the others were going to anchor on the Great Bahamas Bank, a shallow body of water before you reach the thousands of miles deep Tongue of the Ocean. They would get to Nassau in three days, while it would take us two days. 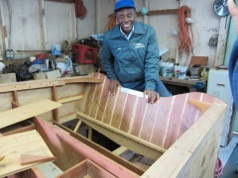 On Friday, we had gone to North Bimini for a few groceries and to visit the boatbuilder and championship bone fisherman Ansil Saunders. He is the brother or Ashley Saunders of Dolphin House fame. On the way, we dropped off Mark’s Minnesota license plate to Ashley Saunders. Amongst his many decorations in Dolphin House, he has hung plates from many different states, but didn’t have one from Minnesota. This is a fine resting place for the plate off Mark’s Corvette which he sold to pay for our engine conversion from hybrid to twin diesels. In the photo, some Minnesota friends might think the blue and white plate with UMD on it is from our state, but it is a South Carolina plate, and the UMD is probably the University or Maryland, not Minnesota, Duluth. We’ll stop by on our way home next May to see where he placed Mark’s license plate. 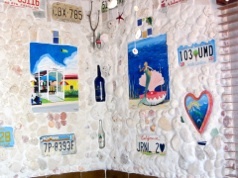 By the way, every work of art on the walls of Dolphin House has been made from small pieces of tile by Mr. Saunders and he also includes found items from the beaches and unique items like the license plate collection. Even though we were delayed two extra days when we didn’t leave on Thursday, it gave us time to visit the Dolphin House and the building where Ansel creates boats. Three brothers from the Saunders family came from Scotland many generations ago and married Bahamians. The current family of ten siblings, eight still living, are spread throughout the world. Ansil holds the world record for the largest bonefish caught. As a sideline he builds boats. The quality is incredible. All are the same basic design with a flat bottom, 3 inch draft, and built from high quality wood. They are works of art. But, bonefisherman and boat builder are only a few of the accomplishments of Ansil Saunders. He has met Queen Elizabeth, Margaret Thatches, a host of other dignitaries. Martin Luther King went out into the Bimini mangroves with Ansel three days before he was assassinated in Memphis. He wrote his last speech and his eulogy there. Ansel said Dr. King knew he was going to die in Memphis. He had been threatened not to return there and felt this would be his last speech. There is a bust of Dr. King in the mangroves where he sat in Ansel’s boat, as well as a statue near the Straw Market in town. Click here to see more photos from the “shipyard” belonging to Ansil Saunders. 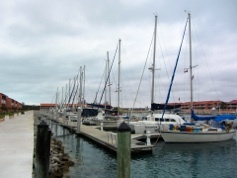 After returning from North Bimini yesterday, we checked out again (even though we never left the marina on Thursday), and prepared to leave early in the morning. We played our last round of Mexican Train with friends Jim and Nancy on Summer Breeze. We went to bed early and set the alarm for 3 am. While Mark was walking Daisy this morning, Tom from Interlude stopped him to say they were going to wait until 6 am to leave, because there was a surge of water coming into the marina, possibly indicating large swells outside. We decided to wait too and left the marina in the dark just after 6 am. At the top of this page is a photo of the sun starting to rise after we were already on our way. 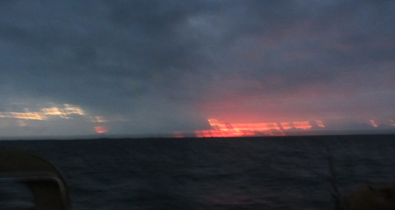 All day, we motored straight into a 10 kt wind. Seas were around 2 ft, so it was a comfortable ride. We averaged 6.5 kts. 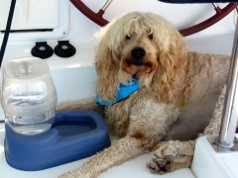 However, leaving later meant we would arrive at the anchorage in Chub Cay in the dark. Daisy doesn’t like to walk around when we are moving, so she generally stays right under the wheel at the helm. 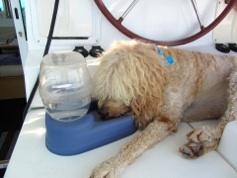 This means she doesn’t get down to drink water, so the water has to come to Daisy. We got to Chub Cay at 7 pm after motoring over 85 miles. We had never been to Chub before, and luckily it was a large anchorage with just three boats there when we arrived. Mark took Daisy ashore and we settled in for a peaceful early evening.